Nothing beats these on ice, was able to ride on literal sheets of it. Could not believe this would be possible. Well done Schwalbe, thank you for saving me via stud (and reflective strip too)! I live in Bend, and commute to work as many days of the year as possible. I run these tires on my touring bike and they are great for days where there is a little snow or ice. The tires really shine on icy roads, it's amazing how well they grip. Cornering feels a bit strange until you get used to it, but cornering grip on ice is no problem. These are not racing tires. They're heavy and make a bit of noise on dry pavement. The rolling resistance will be immediately noticeable, but a small price to pay to stay rubber side down when the roads are nasty. Overall I've very satisfied, and recommend them to anyone who rides when the conditions are less than ideal. Great tire for icy winter conditions. I only use it on the front and only if it is icy. Have a spare wheel with a normal tire for when the snow clears. Love these tires for snow biking. The extra rows of stubs really makes a difference. Also, the reflective stripe works very well. When it is icy out, you want to be seen! Great winter tire, high quality, worth the cost. Schwalbe makes great tires. These are no exception. I ride 20 miles tofrom work every day, and put probably 1000 miles on these this winter. I can't notice any discernible stud wear. They are heavy and loud, but that's the sound of you knowing that you're not going to crash on black ice. If you pump them up to higher pressure, you can get decent speed and a mostly rubber contact patch for those dry winter days. Or just have another non-snow commuter. no prior experience with studs, ran this on the front wheel of my touring bike with a regular tire on the back. very safe of mostly dry streets, have to rin carefully on ice. Great tire for the winter. 2 rides so far in snow-ice conditions in Minneapolis. Slower speeds, but no traction issues. Studded tires make some music, but that's fine with me. Tire pressure on last ride was 50 psi. Very good first icy commute! Here in Portland we just had our first freezing temps with rain this year. My commute takes me along the Marine Drive bike path that's butted up to the Columbia River. This path is an ice rink when these events happen. These tires did an amazing job of keeping me from falling or losing control on the ice path. There were no dry spot to speak of the last 5 miles of the 15 mile ride and with PSI set to about 30-35, the performance on this ice was very good. There was a very small amount of slippage when turning, but once I relaxed my grip on the handle bars, the tires found grip easily. I found that I was only losing about 2 mph average in this condition. At a few spots where trees were downed from the thick ice across the path, I geared down and went off into the frozen grass ditch and powered through without the slightest wheel spin and the front tire went where it was pointed. The downed trees had 2-3 inches of ice on them and the grass was covered the same. This is not the recommended break in for these tires, but all my brake, turning and accelerating was done smoothly, so no studs were lost. One should not be surprise that a tire is heavier with 240 tungsten carbide studs imbedded in each tire. With the pressure up to recommended max, these roll very well for what they are. Best choice for winter commuting tyres. They are heavy, high rolling resistance, and wear out faster compared with normal bike tyres, but they are surefooted and reliable in winter conditions. I ride in weather that stops most automobiles without hesitation using these, including deep (10 - 15 cm) new snow, slush, and ice. Semi-packed sugar snow on streets is difficult but doable. 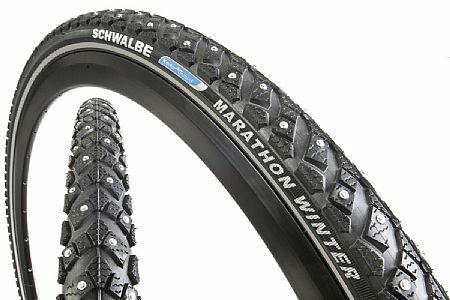 I've been riding Schwalbe Marathon Winter Studded tires for at least 12 years for my daily commute through the entire Michigan winter. The double rows of studs give me great traction both climbing and cornering, even on solidboilerplateice. Ann Arbor does not plow the neighborhood streets when snowfall is less than 4 so cars pack the new snow into a hardpack. The studs bite into that perfectly. When it warms up the hardpack gets compressed into solid ice. The Winter Marathon's bite is still perfect. The tread pattern gives good traction when the hardpack gets churned to cookie dough. Note the tread is directional. So you would think what about when the roads are clear and dry? First off don't expect these tires to perform like a lightweight summer tire. You will hear stud noise against the pavement and they have significant weight - what would you expect with 256 carbide steel studs? But the studs are so hard that they were practically like new after 10 seasons of winter riding. (I remove them for Spring-Summer-Fall riding). Be aware that hard cornering on bare pavement can occasionally pull a stud so take it easy. I'm trying to stay upright on black ice not set a new PR on a Strava segment. I am on my second set this winter of riding 3 miles round trip including snow, ice, and bare pavement. I Donated my used set to the local bike coop. They still had life in them. If you want an absolutely reliable bullet-proof tire for tough winter conditions these tires are it! These studded tires are fantastic for the winter snowice mix that we get in the midwest. I have a lot of confidence in their ability to help me stay upright in even the ugliest weather. The only downside is that they weigh a lot, but that is the price for durability and traction. Initially, I was running them at about 40 PSI, but I can see dropping that down to the low 30's in slipperier conditions. At the lower PSI, all 4 rows of studs are squarely landing on the road surface, which increases traction. Rode a pair of 30c Xerxes last winter that barely did the job and decided I could squeeze a pair of the 35c Schwalbe on this year. What a huge difference! We have had freezing rain on top of melted snow creating skating conditions. Not only does this tire work better it rolls better even on what little pavement I ride. Upgraded to these for my commute and was amazed at the difference over my previous studded tires. Rode over completely glazed roads after freezing rain over hard packed snow. Feel so much safer than I did with my 30c studs and bike rides smoother as well. I have been searching for a durable studded tire for a couple of seasons now and think I found the holy grail in this tire. The problem I've had with other tires is that the studs wear out really fast on pavement. Last year I wore the studs on a brand new set of tires right down to rubber in 6 weeks (about 500 miles of city commuting). I installed a new set of Schwalbe Marathon Winter Studded tires on my commuter bike about 4 weeks ago and they are performing beautifully. They have about 300 miles on them so far and I can only just barely detect the tiniest amount of wear on the center-most studs - the ones that have maximum contact with pavement. I expect these tires to last several seasons. These tires allow me to go out when the temperatures are hovering around freezing without worrying that I will be taken down by black ice. I've had two rides now where the conditions would have been too slippery for my regular tires. The first was when the paths were covered with about 12 inch of snow and the asphalt sections by road crossings were icy. The other was when there had been light rainsnow overnight. I was riding on hilly and rough country roads with the temperatures around freezing. No slipping or sliding whatsoever. The thing to remember with studded tires is they will abrade surfaces they come in contact with such as the interior of your car -( After one mishap, I now use bath towels to cover the tires where they come in contact with my vehicle. I prefer not to use a bike rack for a variety of reasons. My ride to work is just 12 km, but includes a 50 kmh descent, a flat city section and then a climb with a short stretch of 20%. On the way home the opposite with a longer climb of about 10%. The first day out I ran over a large ice patch in a curve at about 30 kmh. Before I noticed the 5 m long ice patch I was over as if it were dry asphalt. My descent includes some long curves. After six years one of the studs wore through the side wall and slowly flatted. Not bad for such off-label use (some of the studs get pushed to the outside of their holes due to the high speed curves). In packable snow the studs don't reach the ground so they don't help then. For ice they are top. The studs slip a bit on tiles and other hard surfaces when not loaded with the rider, so be careful on dismounting if you ride a high pressure. The added weight matters, but I like the training effect. When you switch to the road bike in the spring, the wheels spin up super easily. I would not do my ride in,winter without the studs. I bought these to use this coming Winter on my commuteradventure bike, so I don't have any time on them in the snow andor ice yet. I did do the recommended 20 mile break-in with them mounted on the commuter and rode to work and back for about a week. They handled fine on the pavement. They sound like frying bacon on the bare pavement. The weird thing is that I set some PR's in Strava on my commutes. Coincidence? Perhaps, but it is a testament to how well they roll.